Another summer, another beer review. Along with drum corps, beer is my favorite summer sports-adjacent, and two of the last three years have brought some form of a review. While I made the annual trip to Delmarva that spawned the other two, I picked this one up locally, despite it also calling the Peninsula home. Two years ago, I said that 3rd Wave's Sour Lime was what Bud Light Lime wanted to be when it grew up. Well, Dogfish Head's SeaQuench Ale has a steady career with a 401k and stock options. Released in 2016 and canned this year, SeaQuench Ale is a Kolsch/Berlinerweisse/Gose blend that calls itself a session sour but, in my opinion, drinks as a gose with its varied lime elements and sea salt. It's a great summer drink that in cans travels well to the beach of even early season tailgates. It's also gotten a few bits of critical acclaim lately - some of which I care about more than others. Men's Health names it among the best light (lite?) beers, a stat that appeals to me simply on the basis of how filling it is. Both USA Today and Food and Wine note that while some beer may be refreshing, SeaQuench Ale actually quenches your thirst. And my Baltimore-Delaware dual consciousness is particularly pleased that Dogfish Head developed this in conjunction with the National Aquarium. 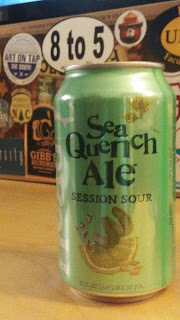 While I've long been a serial trier, you can expect SeaQuench Ale to be my summer go-to for the foreseeable future. If you care that I care about beer, find me on Untappd.